Long Island wedding photographer, Howard Fritz, photographs Claudia and her groom at a beautiful outdoor venue in New York. 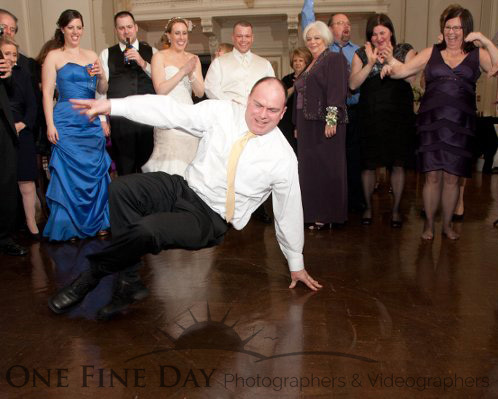 One Fine Day Photographers & Videographers is a Greater New York area team of award-winning wedding photographers and videographers assembled by Howard Fritz. Whether you’re getting married in Long Island, the Tri-State area, or in cities around the country or around the world, we would love to be the ones to capture your beautiful images. 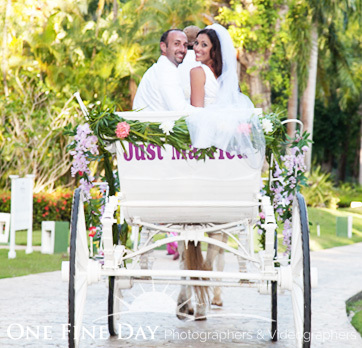 One Fine Day Photographers & Videographers is a Greater New York area team of award-winning wedding photographers and videographers assembled by Long Island wedding photographer Howard Fritz. Whether you’re getting married on Long Island, the Tri-State area, or in cities around the country or around the world, we would be happy to capture stunning images of your special day for you to cherish for years to come. We artfully capture your images in both the classic and contemporary photo-journalistic styles so everyone will enjoy them. With over ten years of working together, our team has the experience to get you the images you want while you enjoy your wedding day. There is a reason why a majority of our couples tell us that we are their favorite vendor to work with. When you trust your wedding day to One Fine Day Photographers & Videographers, you’re not only getting the combined experience of hundreds of other weddings, but you’re also getting a team who will take the time to really understand YOU, and what you’re looking for from your wedding photographer. Of course, we use nothing but high-end cameras, lenses and lighting, but what’s more important is the person behind the lens, who can effectively capture YOUR moments at YOUR wedding, so you’ll end up with wonderful photographs and videos to enjoy for a lifetime. .Howard and I communicated frequently prior to the wedding, and he really listened to all of our concerns. I wanted a specific picture of my husband and I at dusk, and guess what? No problem! While working hard inside the venue, Howard kept track of time, and he brought us outside at the exact moment the sun was setting. Needless to say we got some of the most amazing pictures I have ever seen! – Nohra & Frank Quinones, WeddingWire.com Reviewers. Documenting YOUR special day with a blend of memorable and candid images is what we are known for. .I asked Howard to only take candids during the party, as I really wanted to enjoy the night with my guests, and he was great about doing so. The pictures came out GREAT! Please call us for this season’s rates at (516) 690-1320 or click here to use our quick contact form. To ensure that we keep abreast of the latest imaging styles and technologies, guaranteeing that you’ll always have the best and latest for your wedding, we’re active in the following professional organizations: Professional Photographers of America, Professional Photographers of Greater New York, Professional Photographers Society of New York State, and the Professional Photographers Association of New Jersey. What’s Your Event? We’ll Be There! In addition to photographing and recording video footage at weddings, we also have extensive experience with Bar Mitzvahs, Bat Mitzvahs, confirmations, sweet 16 parties, corporate and other parties, celebrities, media events, and fundraising events for your organization. No event is too large or too small for us to work with, and it is the goal of every member of our team to help create a fine day for you. Whether you’re looking for a photographer and videographer who is well-versed in photojournalism, traditional and classic photography, portraiture, candid photography, videography, cinematography, photo booths, or a combination of several of these, we’ve got you covered. Your team of award-winning photographers and videographers has years of experience in a wide-range of styles, and we’ll be happy to bring this experience to your special event!